Although they're called the Cook Islands, Palmerston is the only one on which Captain Cook ever set foot himself. He discovered it on his second voyage in June, 1774, but it wasn't until Sunday, April 13, 1777, during his third Pacific voyage, that he went ashore. He and his crew took on board supplies of "scurvy grass, palm cabbages, birds, fish and cocoanuts etc" , but they didn't find any fresh water. He landed on a tiny coral atoll which (according to "A Gazeteer of Central Polynesia" published in 1857) was not more than three feet above sea level but had numerous trees and bushes on it and the remnants of a canoe. Cook named the tiny and remote island after Lord Palmerston who was First Lord of the British Admiralty and father of a future British Prime Minister. The ancient name was supposedly Avarau, meaning 200 harbours. William was born a Masters and his name became corrupted to Marsters, possibly because of the way he pronounced it - he came from Leicestershire in England and grew up in the Midlands where the accent would have made it sound like there was an "r" in the middle. To this day, islanders still speak with remnants of an old fashioned English twang which linguists say resembles a Gloucestershire accent. But modern communications are gradually eroding that. Palmerston was annexed to the UK on 23rd May, 1891 and soon after, the British Government granted William a 21 year lease on the island, after a long war of words in the corridors of British power while a Scotsman contested William's claim. The Marsters family were granted full ownership of Palmerston in 1954 by means of an amendment to the Cook Islands Act passed by the New Zealand Parliament. Three branches of the family remain and each has a section of the main island for houses and crops, and parts of the other islets. Marriage within a family branch is prohibited. The Islanders are also fiercely loyal to Her Majesty the Queen (Queen Elizabeth II) who they say is a distant relative. The island is so remote, it wasn't even properly located on maps until 1969! Up and till then, its position was based on Captain Cook's original charts which showed it 10 miles away from where navigation satellites have now confirmed it really is. Around the reef are six groups of islets, the largest being Palmerston. The others are North Island, Lee To Us, Leicester, Primrose, Toms and Cooks. William Marsters built his own home on Palmerston from shipwreck timbers and driftwood found on the shores at the time of his landing. And it's still standing after more than 150 years...only the corrugated roof is recent and the the original is still underneath. The photo far right shows how big and sturdy the timbers are, and still how perfect. Today, the building is used as a storeroom and cyclone shelter. All the islanders are descended from one Englishman, William Marsters - described by some as a labourer and others as a carpenter and barrel maker - who arrived from Manuae on 8th July, 1863. He was accompanied by three Polynesian women, at least one of whom he had married. He subsequently ended up with four wives, although it's not clear whether her married more than one. And that was after deserting his first wife and two children in England. Masters had 17 children by his Polynesian wives and 54 grandchildren before he died on 22nd May, 1899, aged 78. By the time his youngest daughter, Mrs Titana Tangi died in 1973, there were over one thousand Ma(r)sters living in Rarotonga or New Zealand. Fewer than 60 remain on Palmerston...but wherever they live, they all consider it their homeland. Palmerston is an atoll made up from the summit of an old volcano which rises 4,000 metres (13,123 feet) from the ocean floor. At its highest point, it's just 4 metres (13 feet) above sea level. The land near the reef is infertile, but there are typical atoll tree crops of coconut and pandamus. The island is a major nesting site for the green turtle and rare seabirds. Ships visit with supplies only a few times a year, so the HF telephone station (above right) provides the only permanent link with the outside world. There are two telephones. And now even the internet has reached this remote atoll...access is available four hours a day. Visiting yachts help supplement the island's supply needs. 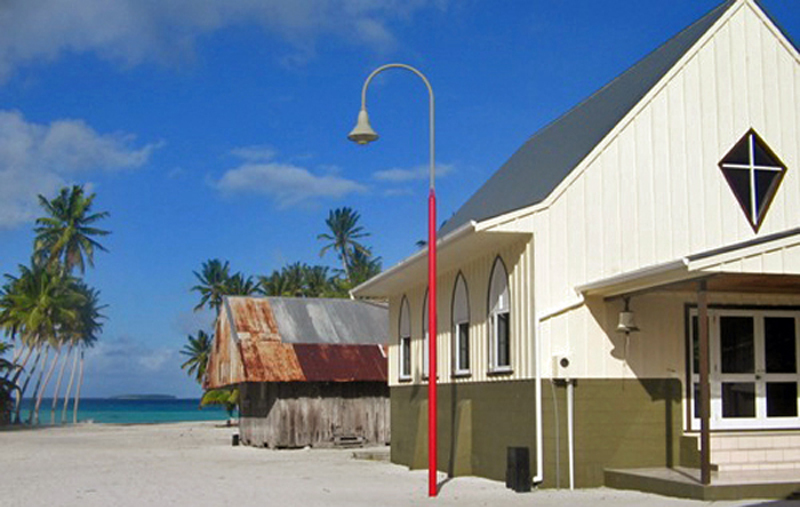 Religion plays an important role in everyday life on Palmerston. William Marsters was converted to Christianity by the 19th century English missionary, the Rev. John Williams, who persuaded him to build the first church. This is a more recent construction. Services are held daily and several times on Sundays. Islanders dress up in their finest clothes. The next generations will have a brigher life thanks to the sun. On the 21 February, 2015, the island came into the 21st century with a round the clock power supply for the first time. A solar power station was switched on, replacing the diesel generator on which the islanders have depended for decades. It also means the island is no longer dependent on the infrequent cargo ships which delivered (or more often than not didn't deliver) the fuel for their generator. "HOW CAN I GET TO PALMERSTON?"